Blondie and Brownie: ¡Feliz Cumpleaños, Brownie! Today is Brownie's aka Alex's birthday. She plans on doing fun things like eating pie and playing with Lil B. After the past few weeks, where that lovely lady has stepped up to the plate while I dealt with terrible family happenings, I will gladly answer the emails, be all social on the Twitters, and take meetings so that she can do this. 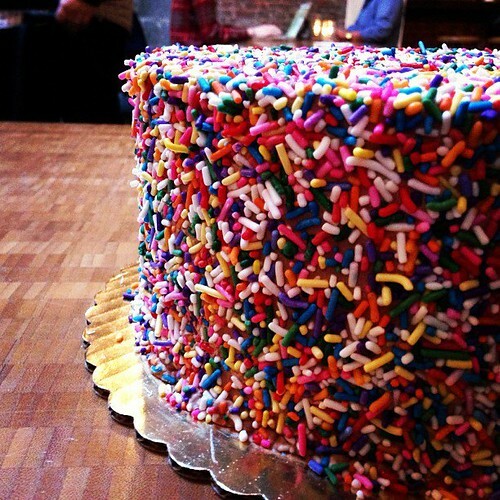 Just let me know if you end up getting a sprinkle cake from Baked because ER MAH GAWD, SPRINKLES!!!!!! Happy birthday, lady!